Considering content for the flyer for a show is an illuminating process. For Perfect Blue I worked alongside our Graphic Designer, Speedy Motor Cycle Studio (www.speedymotorcycle.com), Director, David O’Connor, and Assistant Director, Maura Krause. Each of us offered up our insights of the world of the play as we currently know it. It’s a valuable process that allowed us to think visually about what the play actually is, without getting caught up in the text. Computer text and schematics contrasting with the organic. Modern, beautiful blue, butterflies, high tech. Orchards, maybe even rotting apples, under attack. We took inspiration from film and TV (Melancholia, Black Mirror), and Googled images on the web – bar codes, globes, microscopes, and lots and lots of butterflies. Then with all these ideas, we had to figure out what worked, and, most importantly, what would persuade people to buy tickets! We are a tiny company embarking on a massively ambitious project. We really want and need people to come to the show! The two images our brilliant graphic designer, June, ended up choosing feel like the perfect fit. The photograph was taken on a sunny day this May in Philly by none other than our illustrious director and ended up being the last shot of the day. There was something post-apocalyptic about the wall behind us, and the perspective gave the idea that Carys was walking into the future, leaving Michael stranded behind her. The painted drawing of the butterfly on the side was a reference to paintings children make of butterflies by folding a piece of paper in half. It seemed like a good image to represent both the butterflies that Carys designs and the couple’s young son Ethan. 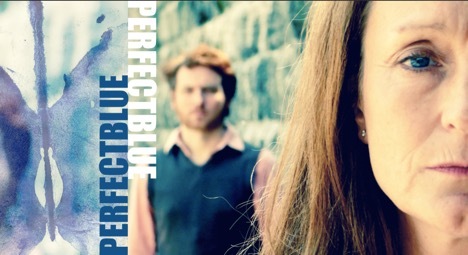 TICKETS FOR PERFECT BLUE: Click here to order tickets.